The gigue-style Fugue (1891) is a student work dating from Rachmaninov’s years under Arensky at the Moscow Conservatoire. 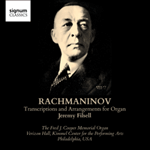 Not perhaps an obvious form in which to work for Rachmaninov, his contrapuntal studies under Anton Arensky and SergeiTaneyev nonetheless translated into the complex linear textures adopted in early works. This concise but brilliant fugue, exercising as ever the technical aplomb of its player, seems a natural fit for the organ.